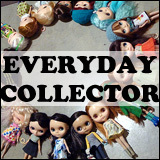 BlytheLife.com » Interview with Vicky of Chicki.co.uk and Giveaway! For those that may remember, I blogged a little bit about Chicki.co.uk a while ago when Vicky was looking for artisans to carry their products in her webshop! It’s a super adorable shop of all things cute that’s based out of the United Kingdom. 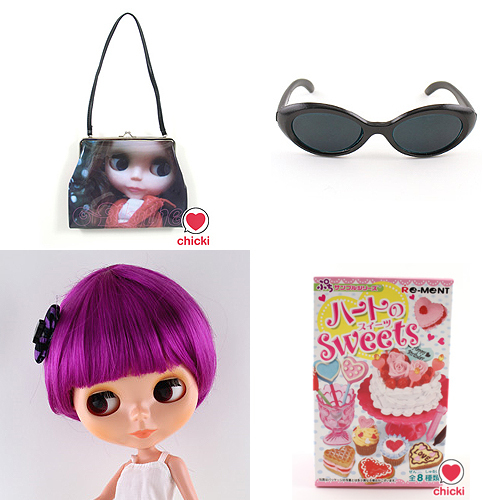 Her shop carries all sorts of things – both Blythe dolls and accessories and other fun things! Hi Vicky! What can you tell us about yourself and how you came to discover Blythe? 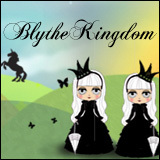 I discovered Blythe about 9-10 years ago whilst at a fashion trade show in London. A European company was producing bags and Apparel with Gina’s images. How did Chicki came to existing? I use to make and sell alternative clothing to a local shop where I also worked part time and decided I would create my own web shop for my items. However after having a baby just over 6 years ago I had much less time so decided to take a new direction. This is when Chicki started to grow into what we see today. 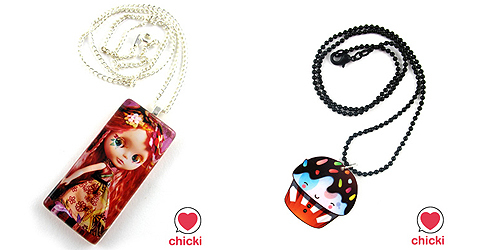 A Zombuki doll necklace (left) and a Scrummyland jelly bean muffin necklace. What makes your site unique on the internet? We enjoy what we do and are in love with the products. My partner is the brains behind all of the web stuff and illustration and we both work hard on the visual side of things. We also try and source smaller brands and artists to work with. It’s so hard trying to compete with the millions of websites out there so having fresh new products helps a great deal. I love the things you have available on your website! How can someone go about getting their products in your store? Well most of the time I just scour the internet for products and hunt them down until I find them. If anyone has anything they think would fit in well with our store they can email us their product information. I’m a super window shopper and love searching out those hard to find items. I just love finding something that’s new and awesome and can’t wait to share it with the customers. What kind of Blythe things are you currently carrying and planning on carrying in the future? 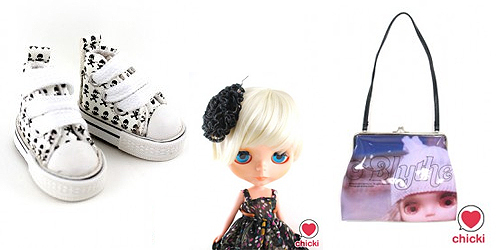 We have got a small range of Blythe dolls, wigs, shoes, clothes, accessories and miniatures. We also sell the wonderful Zombuki products that feature customised dolls. We have also just stocked a couple of lovely Blythe fashion bags (for people). I am working on a new range of Blythe clothing too. Making dolls clothes was one of my favourite pass times as a kid and so I’m happy to get back into this. I also make my own range of miniature food jewellery called Scrummyland so I may also make some doll jewellery. I am also considering stocking the Blythe Littlest Pet Shop range but I’m not quite sure what I think about it so I would love your thoughts. For those who have never placed an order with Chicki, what’s the process like from first visiting your website to receiving a purchase in the mail? Ordering is pretty simple. All you need to do is register as a customer and then shop. We sell worldwide so wherever you are you can get your fix of cute stuff. International orders are sent by airmail so it doesn’t take too long, about 5-7 days on average. We regularly give out coupons and passwords for money off and freebies through our blog, Twitter, Facebook and mail outs so it’s worth checking them out for great money off deals and FREE stuff. From left to right: Scrummyland Happy Lemon Mirror, Luli Bunny Momiji Doll Alex, Very Vicky. I think it’s great that you incorporate your childhood hobbies into your business now! How did you get your start in making miniature food jewellery? It was about 4 years ago that I started making the miniature food jewellery. I had been making a lot of hair bows and necklaces using vintage fruit shaped beads and buttons previously and they were always popular. At this point I decided to concentrate on producing my own range of food inspired accessories. It was also a perfect fit for the other items being sold through Chicki. I love that there’s a little something for everyone in your shop. How do you balance the work and the play sides of things when you’re creating the products and having new things arrive all the time? This is the hardest thing and some days I get very frustrated as I seem to spent so much time dealing with customers, packing orders, accounts, buying, adding new products, product images, the list seems endless. It can be hard to get the time to sit down and create stuff and just when you think you can the dog needs walking or our son needs to be picked up from school. Most of the time I use my evenings to create new products if I can. Also in the quite months I may get a few days here and there to do the stuff I love. It is very hectic but I wouldn’t want to do anything else. From left to right: Blythe skull boots, bobbed blonde wig, Blythe bag with a bobble hat. For both things that you make and other things that sell, what goes through your head when you see the photos that people put up online of the things from Chicki? I love to see people getting pleasure from the things they have got from Chicki it’s a great feeling. When I worked in the clothing store I mentioned before and customers were buying items I had made, or I saw people out wearing my items I felt good but never wanted to point out that it was my stuff. I was rubbish at promoting myself. That’s why I like the whole online community. I find it much easier with all of the social networking tools and have met some great like minded people. Thank you so much for doing this interview with me, Vicky! What kind of advice do you have for someone who’s just discovering Blythe? Not to be afraid of what others might think! You should embrace all that makes you happy. Toy’s are wonderful and joyful things that captivate the imagination. You are never too old for that. Oh yes, one very lucky winner will be winning: 1 super cute Blythe bag, 1 pair of Blythe sunglasses, 1 bobbed wig, 1 box of Re-ment and 1 miniature bag of handmade boiled sweets (not pictured). You can get up to sixteen (16) entries for this giveaway draw and you can enter until Saturday April 9th 2011 at 11:59pm PDT. The draw will be held on Sunday April 10th 2011 and the winner will be announced on BlytheLife.com. Remember to use a valid email address for all comments. If you win, your email will be forwarded to Vicky for arranging shipment of the prize. Mandatory Entry: Comment below about the interview with Vicky of Chicki! Do you have any questions for her? This is worth 1 entry into the giveaway. Bonus Entry #2: Follow the Chicki.co.uk’s Twitter account! This is worth 1 entry. Comment below to let me know that you’ve followed her Twitter account! Bonus Entry #3: Blog about the contest! Be sure to include some details about the contest and include links to BlytheLife.com, this interview/giveaway page and to Chicki.co.uk! For 1 blog entry, this is worth 5 entries into the giveaway! You must comment below with the URL to your blog post. In order for blog posts to be eligible for entries, you are not to copy-and-paste information directly (please write in your own words!). 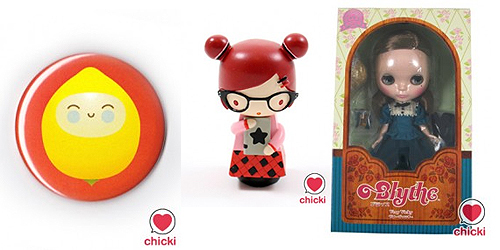 If you can’t wait to find out if you’ve won or found other fantastic things on Chicki.co.uk that you want, Vicky has offered up a discount code just for BlytheLife.com readers! 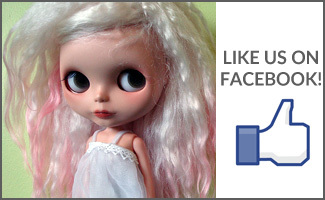 Enter BLYTHELIFE at check out (and remember to update your cart to apply the discount!) for 10% off your purchase. cute blythe products . enjoyed the pics of the dolls and interview . Chicki is wonderful, I’m so happy that she carries the Zombuki necklaces :3 thank you for sharing them here! Absolutely adorable shop, aim to save up and buy there one day. How hard was it to start your own shop like that? There is so much talent in the blythe world! Aww well it’s nice if you can update us when you add new stuff to your store too 🙂 Welcome to twitter. Great products, I will definitely be visiting your store once I have paid off my credit card. Following your twitter account as noituudenaika. I’m so excited about all the extra entries! I haven’t really used twitter for anything else though. Haha. So many cute products! Thanks for doing a giveaway – my fingers and toes are crossed! No extra entries on your blog entry. All blog entries *must* be written by yourself. This is a fabulous web site! So many things that I have been wanting all in one place!!! Eeep!